This is a blog about the inner experiences, problems, and issues we all may have in different situations us or all of us to survive in the world. We were meant to live in Nature under Natures rules. But we invented cities, states, nations, and different cultures or sets of expectations and rules. This confused us all. How do we untangle it all and get back to the basics? In a way we people are Robots. I call the body ‘MYSELF,’ the mind I call ‘Me,” there are four main components, or widgets, of the mind (1) perceptual senses, (2) emotion (fear or love), a (3) thinking, and (4) patience and energy. The widgets work in the order I gave them. First we see, then fear or want, then plan, and finally act. When the widgets work together they make an efficient machine. But the parts do not always work well nor work well together. In order to get the parts to work better and to work together ‘I’ was invented, ‘consciousness.’ The job of ‘I’ is to tinker with the widgets and keep them balanced so that ‘MYSELF’ is an efficient Robot capable of completing missions. That takes a lot of hard work. ‘I’ and widgets are called the Upper Nature. But my maker also included four more ‘Me’ widgets, similar to the four above, to protect ‘Myself’, but if these four act without danger they can be evil. They are (5) Deception, (6) Greed, (7) Blame, and (8) Aggression. To help them work together Dragon was created. You could say Dragon is part of ‘I,’ an alter ego. Dragon and survival widgets are called the the Survival mode, or Lower Nature. They are not very advanced and need the help of the Upper Nature to act correctly. So ‘I’ has to keep control of the four good widgets, to help control the four evil widgets, to keep control of Dragon, so ‘Myself’ acts in healthy ways and protects other Robots in the Robot family. In real danger ‘I’ may need Dragon and the evil widgets for survival purposes. Take a look at the Widgets, these guys can be real frisky or dead beats. The cartoons to follow in the posts will show some of our conflicts and my struggles with them in situations. ROBOTIC ME: First Post: ‘I’ has to be in control or ‘Me’ Widgets take over. THE STRUGGLE IS BETWEEN ‘ME,’ ‘MYSELF,’ AND ‘I’ IN RESPONDING TO INTERNAL OR EXTERNAL SITUATIONS. AS WE KNOW, IT IS NOT AN EASY TASK. 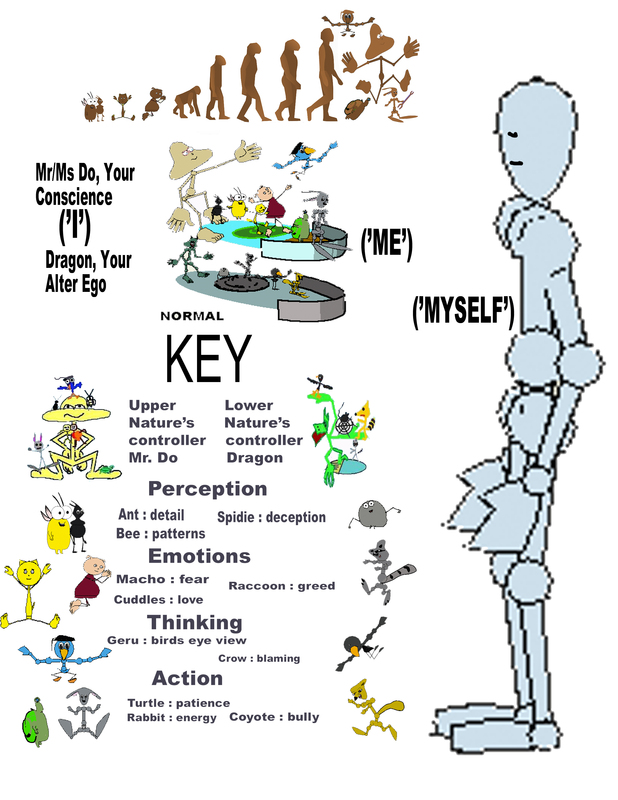 HOW EASILY ‘I’ CAN HANDLE THE WIDGETS OR ‘ME’ AND HANDLE ‘MYSELF’ DETERMINES OUR PERSONALITIES. WHY THE WIDGETS DIFFER DEPENDS ON THE INBORN STRENGTH OR WEAKNESS AND LEARNED SKILL OR KNOWLEDGE OF EACH AND EVERY WIDGET. WHAT ARE WIDGETS? READ THE PAGE CALLED “READ FIRST:ROBOTIC Me, Myself, and I, in situations. IF YOU DO NOT SEE THE PAGE ON YOUR SMALLER DEVICE LOOK FOR AND CLICK ON MENU. CONSCIOUSNESS, ‘I’ MUST CONTROL THE WIDGETS OF ‘ME’ IN ORDER TO CONTROL ‘MYSELF’ because ‘Myself’ wants pleasure and wants it NOW without thinking of consequences. To see consequences ‘Me’ has to see, feel, think about and plan to avoid, and then be patient and motivated enough to avoid bad consequences. Ant and Bee is easily drawn to bright colors and light. An iPad is very tempting. Dragon is always there to encourage self indulging behaviors. Without love and fear of hurting another there is little reason not to just take it. Without fear of hurting another there is only fear of not getting what ‘Myself’ wants. 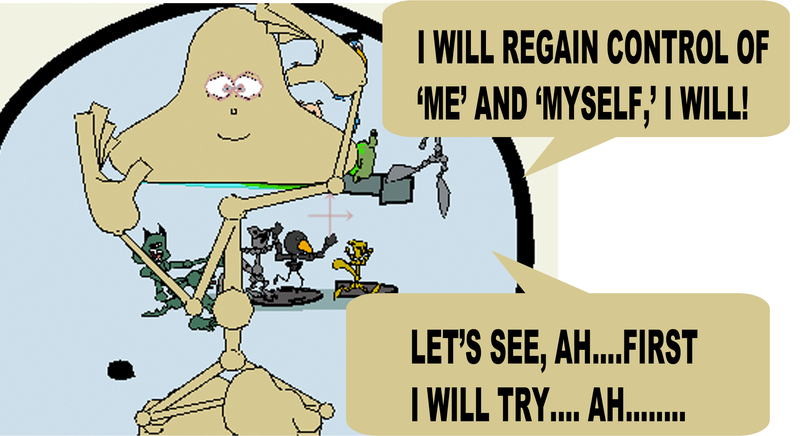 Geru has to give ‘Myself’ and ‘I’ a code of ethics. Rabbit has to hold ‘Myself’ back and not push him forward. ADHD Rabbits will lurch forward without thinking. Dragon only fears the iPad will not belong to ‘Myself’ and urges ‘Myself’ to just act. ‘I’ must has to step back and rethink, and rehearse what should be done the next time such a situation occurs. So what do you do to train ‘Myself’ and ‘Me’? Much like you train a pet. Practice and treats for proper behavior. Look for consequences, care about others and health, fear hurting others not of not owning something thats not healthy, plan and rehearse proper behavior, and practice. When you do it right reward yourself. When you do it wrong rehearse with a better plan and try again. Just as we do with our pets, and remain hopeful.